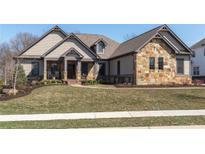 Below you can view all the homes for sale in the Brookside subdivision located in Westfield Indiana. Listings in Brookside are updated daily from data we receive from the Indianapolis multiple listing service. To learn more about any of these homes or to receive custom notifications when a new property is listed for sale in Brookside, give us a call at 317-308-8198. Newer Out Door Space See You Soon! MLS#21632693. CENTURY 21 Scheetz. This home has everything you could want and more! MLS#21630895. Keller Williams Indpls Metro N.
This home on a great lot with a pool will not last long! MLS#21630437. ERA Real Estate Links. Open concept basement with 9' ceiling is GREAT for entertaining, has a wet bar with extra counter space for socializing, open to a large game/media room, full bath, 5th bedroom and a 6th bedroom/exercise room. MLS#21629763. Sigma Builders Real Estate, LL. Home audio system delivers music inside and out. MLS#21628797. Thorpe Real Estate, LLC. Offering an executive office with built-ins, spacious master and 3 additional bedrooms upstairs, as well as Recreation room, workshop, full bath and potential 5th bedroom/storage space in basement, this home is sure to delight any family! MLS#21618653. WKRP Indy Real Estate. Fully fenced backyard with mature trees and a short walk to neighborhood clubhouse/pool. MLS#21625734. F.C. Tucker Company. Prime Cul-De-Sac Location and 4 Car Garage, Close to Schools, Grand Park, and Downtown Westfield MLS#21623684. RE/MAX Legends Group. Home also has plenty of storage. MLS#21615060. ERA Real Estate Links. 5th bedroom located in the finished WALKOUT basement that includes an open theater room and wet bar! MLS#21613445. ERA Real Estate Links. Upper porch and walk out lower level patio all connect in the large rear yard which is next to common area and backs up to common area. MLS#21605502. Bob Slawson Realty. Tons of details to this home! ! MLS#21604404. ERA Real Estate Links. 4 car attached garage and plenty of storage! Don't miss this opportunity! MLS#21596441. RE/MAX Ability Plus.